The Indo-OIC Islamic Chamber of Commerce and Industry (IICCI) maintains this website (the “Site”) as a courtesy to those who may choose to access the Site (“Users”). The information presented herein is for informative purposes only. IICCI grants permission to Users to visit the Site and to download and copy the information, documents and materials (collectively, “Materials”) from the Site for the User’s personal, non-commercial use, without any right to resell or redistribute them or to compile or create derivative works therefrom, subject to the terms and conditions outlined below, and also subject to more specific restrictions that may apply to specific Material within this Site. 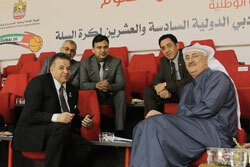 The Indo-OIC Islamic Chamber of Commerce and Industry (IICCI) administers this Site. All Material on this Site from The Indo-OIC Islamic Chamber of Commerce and Industry (IICCI) appears subject to the present Terms and Conditions. Unless expressly stated otherwise, the findings, interpretations and conclusions expressed in the Materials on this Site do not necessarily represent the views of IICCI, its member organizations or partners. While The Indo-OIC Islamic Chamber of Commerce and Industry (IICCI) endeavours to provide accurate material on its website, it gives no warranty concerning the accuracy of the material provided by this service. Users should refer to the originating bodies or sources of the documents for confirmation of the accuracy of the material. The Indo-OIC Islamic Chamber of Commerce and Industry (IICCI) provides hypertext links to a number of external sites, but does not accept responsibility for material on these external sites. The Indo-OIC Islamic Chamber of Commerce and Industry (IICCI) will have no responsibility or liability in relation to any loss or damage which you incur, including damage to your software or hardware, arising from your use of or access to this site. The Indo-OIC Islamic Chamber of Commerce and Industry (IICCI) reserves its exclusive right in its sole discretion to alter, limit or discontinue the Site or any Materials in any respect. 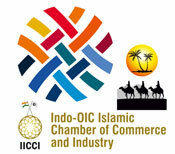 The Indo-OIC Islamic Chamber of Commerce and Industry (IICCI) shall have no obligation to take the needs of any User into consideration in connection therewith. The Indo-OIC Islamic Chamber of Commerce and Industry (IICCI) reserves the right to deny in its sole discretion any user access to this Site or any portion thereof without notice. No waiver by The Indo-OIC Islamic Chamber of Commerce and Industry (IICCI) of any provision of these Terms and Conditions shall be binding except as set forth in writing and signed by its duly authorised representative. Unless otherwise noted, information on this site may be freely reproduced by IICCI member organisations, with credit given to this source. Others may request permission to use the material. "NO SEPARATE BANK ACCOUNT BE OPENED IN ANY COUNTRY EXCEPT INDIA BY ANY OFFICE BEARER OR DESIGNATED POST BEARER OF INDO-OIC ISLAMIC CHAMBER OF COMMERCE AND INDUSTRY-IICCI. IICCI IS NOT RESPONSIBLE FOR THOSE FICTITIOUS BANK ACCOUNTS OR ANY FINANCIAL TRANSACTIONS MADE OR ROUTED THROUGH / IN SUCH FAKE ACCOUNTS. NO DONATION IS SOUGHT OR MONEY TO BE COLLECTED IN ANY FORM BY ANY OFFICE BEARER OR POST HOLDER WHATEVER DESIGNATION IS GIVEN"